The wind howls at 40 knots with gusts as high as 47 knots as we lay at anchor at Great Sale Cay on the Little Bahama Bank. The sun is setting, its getting dark, and the passing cold front is scary, noisy, and putting my boat and our nerves to the test. Its windy season in the Bahamas, so we have to use a window of opportunity to get home to Florida the next day or the day after. We are on our way home from probably the most memorable diving trip I ever had so far, to the magnificent Crystal Caves of Abaco. This is my third cave diving trip to Abaco. Ive seen the wonderful caves of Florida and Mexico, all of them unique and beautiful in their own ways, but they all pale when compared to the awesome beauty of Dans Cave or Ralphs Cave of Abaco. The experience of these huge cave systems easily justifies the small unpleasantries of our voyage. I am a privileged diver, indeed. 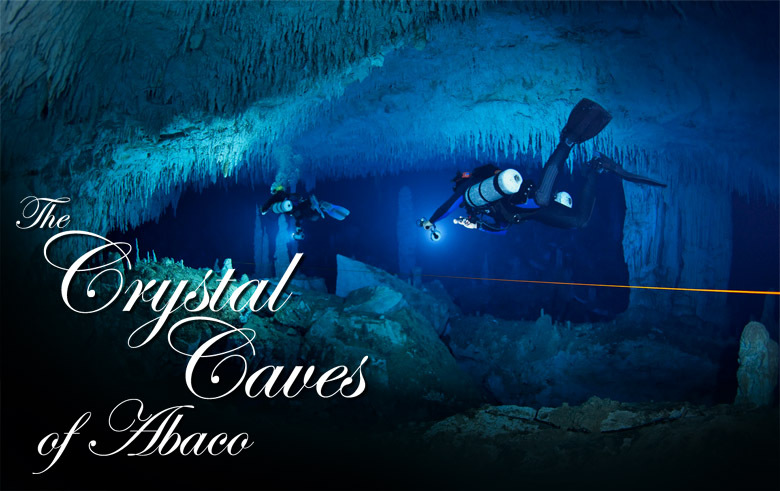 Not only have I had three opportunities to dive the Crystal Caves already but, this time, I had the extraordinary luck to dive with not only one but two of the most famous cave divers in the world. Brian Kakuk is the owner of Bahamas Underground, an excellent dive operation in Marsh Harbour, Abaco. He is an explorer like few others, having laid, without exaggeration, hundreds of thousands of feet of line in Bahamian caves. In a good year, he explores more then 30 virgin caves. 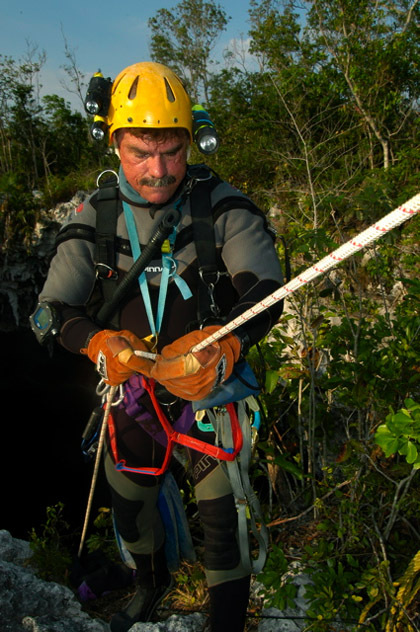 He has been an explorer in the Bahamas for more than 20 years now, with a perfect zero-accident safety record, despite countless extreme solo exploration dives. Brian was also my sidemount instructor, and he was our guide on this trip, just as on my two previous visits. Jill Heinerth, another world-famous explorer, with credits such as diving an Ice cave in Antarctica, is usually a very busy woman, with little time to spare between film making, photo shoots, training, exploring, and promoting the sport we all love at various forums as a sought-after public speaker. I know Jill from my CCR trimix course, which she taught at Eagles Nest in Florida. I was lucky this year when Jill accepted our invitation to join us, as she just happened to have set some time apart from her otherwise busy schedule. Im only an amateur videographer and photographer. I never managed to get decent cave diving photos, and my only video credit worth mentioning is the film In the Realm of Fangorn Forest, which I took with Brian last year. Jill, on the other hand, is a true master of underwater photography and videography. The photos and video she took during our dives are a piece of art. The way she was able to handle all the video and photo gear, even through tough restrictions, and on long dives, requires diving skills that can only be acquired by a combination of tremendous talent and years of practice. The nice thing with Jill and Brian is that they always treated me as an equal member of the dive team, despite the huge skill gap between them and myself. Truly experienced divers dont have the urge to point out every little mistake, as is unfortunately common for legions of Internet cyber-divers, some freshly-minted instructors, and the wannabe-explorers. On our first day of diving, after hauling all our dive gear from my boat to Brians shop, we did two relatively easy sidemount dives at Dans Cave. This was important for me, since it had been six months since I dove caves the last time. I needed two dives to get my gear streamlined again and to practice my skills. We would only be doing sidemount dives on this trip. In contrast to my previous visits, we left our CCRs at home. Like Jill and Brian, I believe in using the right tool for the job and, while a rebreather is often the best option, sidemount diving is a better choice for the Abaco caves. If you are only backmount or CCR trained, there is still plenty to see, but there is even more for those of you who have sidemount training. Perhaps some day we will have off-the-shelf sidemount rebreathers, so we can combine the best of both worlds! On our second day, we first dove Ralphs Cave. It was just as beautiful as I remembered it from last year. Like the other caves on Abaco, Ralphs Cave experienced various periods of growth when it was above sea water level. Some of the formations are as old as 350,000 years, and others as young as 13,000 years. Accordingly, these caves have a fascinating mixture of transparent soda-straw stalactites and stalagmites, and the strange, gravity-defying helictites that grow in all kinds of weird directions and shapes, as well as the older, massive formations that look like colorful branches of massive trees. There are crystal pools on the ground, and columns that are as high as 30 feet and as thin as a twig or as big as a sequoia tree. Ralphs Cave, just like the other caves on Abaco, is a geologists dream. We took a lot of video at Ralphs Cave, which turned out to be harder than what I did last year at Dans Cave because many of the formations are within the halocline. I tried the same technique as with my Fangorn Forest movie from last year, but it didnt work out very well. Only the lead diver, holding the massive 200W HMI video light, had a clear view, while the water in the halocline behind the lead diver got disturbed and did not offer a good opportunity for video. Still, we managed to get some fascinating close-up video during this and other dives. Our second dive of the day was in Dans Cave, in an area called The Badlands. I have no idea how this part of the cave got its name, because it is anything but bad. 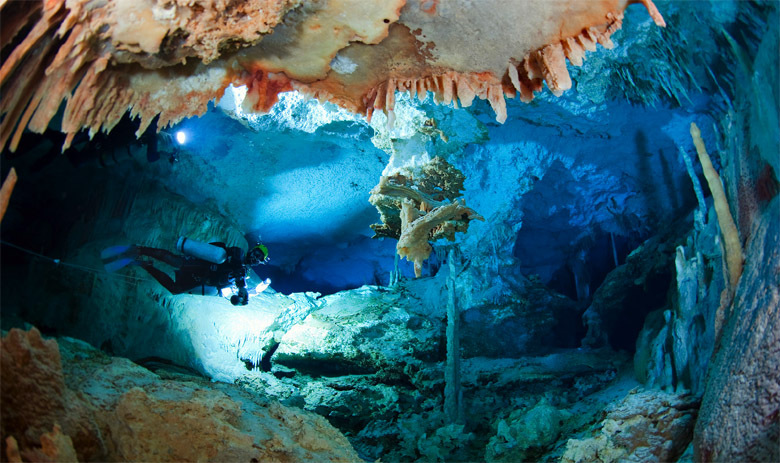 On the contrary, the narrow, sidemount part of the cave had some of the most fascinating formations Ive ever seen. Jill used the opportunity to take some awesome pictures. On day three, we did a double-stage dive to Fangorn Forest in Dans Cave. This was my first stage dive with a sidemount configuration and, apart from all the schlepping of tanks, it worked out surprisingly well. Still, a CCR is my preferred configuration for these kinds of dives since there were no major restrictions, and I also tend to get cold more quickly on long open-circuit dives. Jill and Brian took more video of all the crystal formations in this famous part of the cave. On day four, we went to Ralphs Cave again for more video. The plan was for me to take wide-angle video together with Brian, while Jill would do macro videography. Unfortunately, my camera video lights flooded on this trip and, to top it off, the big 200W HMI light that we wanted to use for wide-angle video died. I guess that eventually happens to every underwater videographer at some point, but of course it was still disappointing (and pricey). Thankfully, Jills camera system and lights performed flawlessly, so she could take more close-up video. The second dive of the day took us to a different location in the Dans Cave badlands again, with more great photos shot by Jill. On day five, I took a break, since bad weather came over Marsh Harbour, and we didnt have a good slip at the marina. I didnt want to leave my boat alone so I could rearrange lines and fenders when necessary. As it turned out, this was actually good timing because Jill and Brian wanted a day for lots of photo shoots for their new upcoming sidemount manual, showing all the different gear configurations and techniques. As Im writing this, Jill is working on her textbook. From the few peeks I had, it looks awesome. 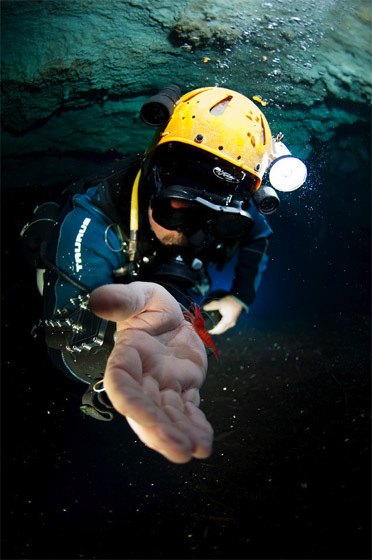 If you have any interest in sidemount cave diving at all, buy this book! We really planned seven days of diving, but the weather forecast showed a window of opportunity only for getting back a day earlier, otherwise we might have been stuck at Marsh Harbour for another full week. Well, stuck sounds a bit negative, as I really can imagine things that are worse than cave diving for another full week! But Jills and my own work schedule required us to get back to Florida, so we had no other option. So, on the final day, we did a single stage dive in Dans Cave, passing through a very tight restriction called Richs Rub, which Brian also dubbed the Velcro Restriction. Even after dropping the stage and taking one tank off, it took a lot of effort to get through. The reward was a beautiful large room called the Airplane Hangar, nearly as big as Wrigley Field beyond Fangorn Forest, with fascinating formations on the ceiling that looked like icicles. We left the next morning, knowing well that our voyage home would probably take three full days because of the many cold fronts that were approaching the Bahamas. We are now back half way and at anchor, sorting photos, video, writing dive reports and sidemount manuals, and look forward to getting back home when the weather clears up, to share our photos and our stories with friends and family.